This course provides an introduction to makeup water for Industrial water systems. Many installations use fresh water and, often, potable water. Makeup water, often referred to as “makeup,” is fresh water that is added to an industrial water system to replace water lost by blowdown, evaporation, wind drift, leaks, steam, humidification, or withdrawal from these systems. The usual source of makeup water is the installation's potable water supply. This source is water that has been conditioned and is usually of a very uniform quality from day to day. Other sources of makeup water could include groundwater obtained from shallow or deep wells, or surface water from streams or holding ponds. These sources are not treated to the extent that the potable water source is treated. Still another source is reuse water (i.e., water that is “used” and reclaimed and not rated as potable). Learn how to remove dissolved gases such as carbon dioxide, hydrogen sulfide and methane. This course is intended for mechanical engineers, civil engineers and other design and construction professionals wanting an introduction to makeup water and makeup water treatment for industrial water systems. This course will give engineers and others an introduction to the importance of treatment of makeup water for industrial water systems. 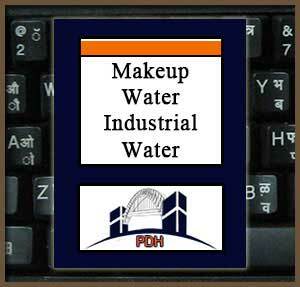 After completion of this course you will be prepared for advanced learning about makeup water for industrial water systems.